What Really Happened at the Sunspot Observatory in New Mexico? Conspiracy theories now abound at the closure of the Sunspot Observatory in New Mexico. With the facility being abandoned for over a week, many believe there to be an extraterrestrial reason for the scandal. The New Mexico Solar Observatory re-opened after it had to be evacuated and shut down for ten days. We were hoping it was First Contact with the Trisolarians, but a criminal investigation ruled out alien intervention. What does the Internet say? 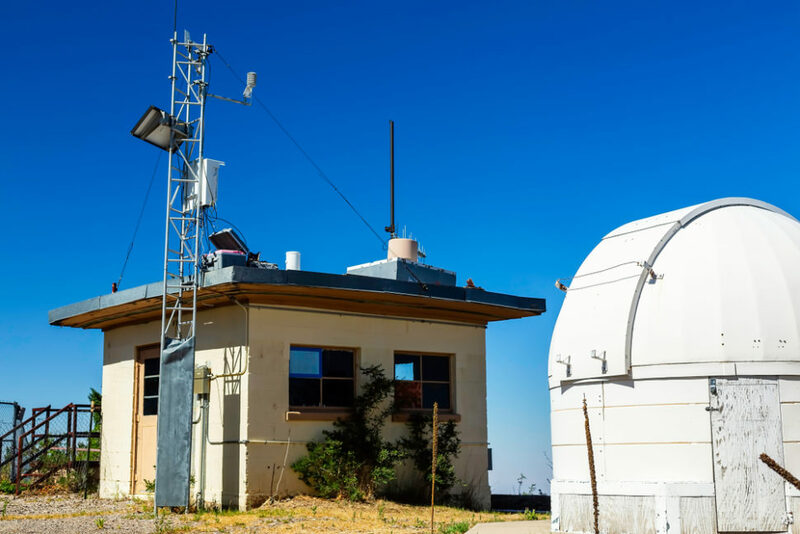 The Sunspot Solar Observatory (SSO), atop Sacramento Peak, NM, is part of the National Solar Observatory (NSO) network and has been studying the Sun and solar flares since the 1950s. However, on Sept. 7, the staff was asked to quickly vacate the premises and to stay off the mountain, and the SSO shut down. Everyone remained in the dark as to what really happened, including the staff. Then on Sept. 14, the Association of Universities of Research in Astronomy (AURA), which manages the facility for NSO cited a “security concern” as the reason for the shutdown of the observatory that “will remain closed until further notice”. What Went Wrong at the Sunspot Observatory? On Monday, Sept. 17, the Sunspot Observatory re-opened after being shut down for 10 days due to a mysterious “security issue”. AURA released a statement saying that during the 10 days of the shutdown, it has been cooperating with the FBI that conducted an investigation on the site “of criminal activity that occurred at Sacramento Peak. During this time, we became concerned that a suspect in the investigation potentially posed a threat to the safety of local staff and residents”. As to why the staff had to be evacuated from the facility itself and residents from their homes at the Sacramento Peak, AURA says its because “the logistical challenges associated with protecting personnel at such a remote location, and the need for expeditious response to the potential threat”. AURA admitted that “the lack of communications while the facility was vacated was concerning and frustrating for some”, a measure the organization says it has to take to not impede the ongoing investigation and alert “the suspect”. But, wouldn’t this presumed suspect have taken notice of the abrupt evacuation and shutdown of the facility, for 10 days? Has the suspect been apprehended yet? What’s the “criminal activity” the suspect was engaged in? Naturally, the shutting down of a major observation facility only a few miles away from Roswell has led to many tinfoil hats being thrown into the air. Although there is zero proof or evidence of extraterrestrial intervention, the lack of response and communication has led to an abundance of theories. Would we want belligerent extraterrestrials to contact us or come down to Earth? Why would they choose to target a Sunspot observatory in New Mexico? You can take the FBI for their word if you want, but official explanations can’t stop the internet from going wild. In fact, based on history, official scenarios only fuel the fire of speculations in this kind of stories that involve space activity in any capacity. As you’d expect alien conspiracy theorists had a field day, and it didn’t hurt that the Sunspot Observatory is just about 85 miles of Roswell. Some suggested that UFO has been spotted by the observatory’s staff and that the “Men in Black” were on site trying to do their usual covert job. In the age of smartphones and the Internet, is it still possible for these alien encounters to continue? Naturally social media conspiracy theorists went into overdrive after this event, with theories about the presence of an alien fleet near our Sun, or the rogue planet Nibiru, to a mercury leak or an imminent massive solar storm. What’s your theory on what happened at Sacramento Peak? A spy among the employees at Sunspot!! later found dead in the mountains not to far away.